Initially a one man band from France, Dirty Deep is now a power blues trio in the same vein than Left Lane Cruiser and Black Diamond Heavies. “What’s Flowin’ In My Veins” is a gritty release that should ideally be heard in company, with a stack of beers and smokes close to hand – it’s just that sort of record. 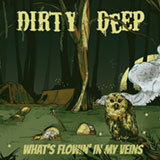 Simple and to the point, Dirty Deep gets at the spirit of rock and roll and makes us face the terrors of a forgotten world.